Faced with the mounting traction of a primary election challenge from U.S. Rep. Colleen Hanabusa, Gov. David Ige swung at a lobbed softball question during a recent interview at The Maui News. What would he like to tell Maui County residents? He pointed to his administration’s goal of producing 10,000 new housing units statewide by 2020. How many of those units were in Maui County? Ige laughed and admitted he didn’t know. The answer was not forthcoming until The Maui News followed up Friday via email with an official in the Governor’s Office. Later, a spreadsheet titled “Housing Production Report” showed Maui with one completed project, the 56-unit “Kulamalu Affordable Family” project. It represented 1.7 percent of the 3,194 completed affordable housing units on the list. Projects in Kakaako in Honolulu amounted to 1,416 affordable and 1,924 market-priced units on the list, for a total of 3,340 units, or 62.2 percent, of the 5,367 completed units overall. Hawaii island was listed with 166 affordable units completed, and Kauai had 134 units. Oahu had another 1,422 affordable and 249 market-priced units on the list. In the “in construction” category, Maui has 39 units at the Hale Mahaolu Ewalu project. (The total “in construction” was 2,426 units, including 1,477 affordable and 949 market units.) And, in the “planned/pending category,” Maui has three projects — Kenolio Apartments, 186 units; Kahului Lani, 82 units; and Kaiwahine Village, 64 units. (The total “planned/pending” list has 4,655 units, including 3,050 affordable and 1,605 market.) Most of the homes being built or planned are on Oahu. “We feel very good about our goal to complete 10,000 new housing units statewide,” he said. When asked to respond to the perception that state government is “Oahu-centric,” Ige said he has heard that for a long time. But, “I directed all the Cabinet members to really pay attention to the Neighbor Islands and Neighbor Island issues,” he said. The governor said his administration facilitated the transfer of Maui Memorial Medical Center and other public hospitals in the Maui Region from the Hawaii Health Systems Corp. public health system to the Kaiser-affiliated Maui Health System; directed the state Department of Transportation to identify solutions and prioritize highway projects; and backed construction of the new $340 million consolidated rental car facility at Kahului Airport. “You know, I’m seeking and asking for various members in the community to support our campaign and my candidacy,” he said. “And, you know, we’ve gathered a good collection of community members to support (me). . . . I think that we have a terrific story to tell. . . .
As for his administration’s accomplishments on Maui, he discussed the transition of public hospitals in the Maui Region to Hawaii Health Systems, a process that was delayed a year by public union legal challenges. Hanabusa has used the word “rudderless,” to describe Hawaii’s position under Ige’s leadership. 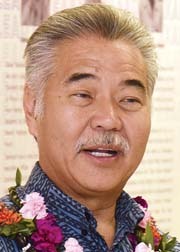 Ige said his administration has led the first interagency biosecurity plan to keep away invasive species; has been committed to protecting watersheds and the ocean; and has led in development of a blueprint for education. “You know the old, one-size-fits-all drove our public education system for too many years,” he said. “We’ve embraced the notion of school empowerment and that every school should really be driven by those closest to the children, the community and the educators that are at the school. Ige said he’s promoted the “Early College” program to allow high school students to take college-level courses while in high school and get an associate of arts degree before graduation. “I really believe that it’s a game-changer for our public school system,” he said, pointing out that families can save up to $7,000 or $8,000 in college tuition with the program.